This photo doesn’t look like the Joe Rosenthal photo that won the Pulitzer Prize, and then inspired the book and movie, Flags of Our Fathers? It’s not the same photo. Different photographer. Different group of Marines. This is the first flag raising on Mt. Suribachi, the highest point of the island that was known then as Iwo Jima. This shows the mean of Easy Company, including Charles Lindberg of Grand Forks, North Dakota, raising a flag they carried on a pipe they found. The photo was taken by Sgt. Lou Lowery of Leatherneck Magazine. Charles Lindberg, one of the Marines in the photo, died this week. He was 86 years old. In addition carrying a name made famous by that other guy, the pilot, few people believed him when he said his company raised the flag first on Iwo. He wasn’t in the Rosenthal photo. But Lindberg told the truth. Three of the men in the first raising never saw their photos. They were among the more than 6,800 U.S. servicemen killed in the five-week battle for the island. By Mr. Lindberg’s account, his commander ordered the first flag replaced and safeguarded because he worried someone would take it as a souvenir. Mr. Lindberg was back in combat when six men raised the second, larger flag about four hours later. Rosenthal’s photo of the second flag-raising became one of the most enduring images of the war and the model for the U.S. Marine Corps memorial in Washington. Rosenthal, who died last year, always denied accusations that he staged the photo, and he never claimed it depicted the first raising of a flag over the island. Mr. Lindberg was shot through the arm March 1 and evacuated. After his discharge in 1946, Mr. Lindberg went home to Grand Forks, N.D. He moved to Richfield, Minn., in 1951 and became an electrician. If you’re over 45, if you read James Brady’s Flags of Our Fathers, if you saw the Clint Eastwood movie version, or if you’re a fan of Johnny Cash’s Ballad of Ira Hayes, you know the stories of heroism and sorrow and tragedy that accompany Joe Rosenthal’s photo. As so often happens in history, there is a back story, a bit of a correction — and it has some of the same bittersweet flavors. Lindberg was 24 years old when his company landed on Iwo Jima. That was 62 years ago. Those who were eyewitnesses are mostly gone. We need to seek out those few remaining, brave survivors, and let them tell what they remember, what they saw, how they felt and how they feel. Of the twelve men who raised the two flags, Lindberg was the last survivor. Three of the men from each group died in battle action after raising the flags. Here’s to the memory of Charles Lindberg, a good American, a good soldier. Thank you, Mr. Lindberg. Charles Lindberg holding the photo taken by Sgt. 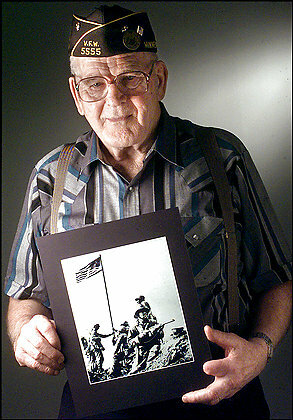 Lou Lowery of Leatherneck Magazine, of the first U.S. flag raising on Iwo Jima, by Easy Company. Lindberg is the soldier standing in back, on the right of the photo. Lowery’s photo was taken about four hours before the second flag raising, captured by Joe Rosenthal, which photo won the Pulitzer Prize. This photo of Lindberg, left, is from 1999, by Associated Press photographer Jackie Lorentz. Lindberg’s citation for the Silver Star is below the fold. This entry was posted on Tuesday, June 26th, 2007 at 12:24 pm and is filed under Accuracy, Famous Battles, Flag ceremony, Freedom - Political, Geography - Physical, Heroes, History, World War II. You can follow any responses to this entry through the RSS 2.0 feed. You can leave a response, or trackback from your own site. You can probably find a lot of the photos from official and semi-official sources online at the Library of Congress and at the Navy History Archives (for Marines); I suspect the Army has a similar archives, though I can’t find it right now. You could compare the photos to see whether they are copies of these archive shots. I suspect you have a personal photographic diary, but I’m no expert. Who did your aunt know who might have served in the Pacific, or who may have worked in Atlanta developing pictures? I have found photos in my aunts possession at her death of WW11. I have a black and white snapshot of the 2nd flag raising and numerous photos of dead solders, a surrender of some Japanese soldiers, the landing on the beach , and several others. Could someone explain how these photos were available. They were developed in a place in Atlanta, GA. My grandmothers sisters husband was in the second photo by Rosenthal. Were these pictures available to the solders, or do i have an original set of pictures? My grandfather knew him from the VFW met him once, great guy. Thanks for the nice tribute to Cpl. Lindberg. I’ve read several accounts of the battle and have met two Iwo vets. Both didn’t have a lot to say re: their service and part in the battle. They were more forth-coming with remembrances of those who didn’t re-board ship with them after the battle. God bless every one of those who went through that particular hell. None but the Marines could have done it. This is the kind of man I show to my kids and grand kids as a hero. GOD BLESS ALL OUR VETERANS. Well done Marine, Simper Fi. carry on. Thanks for the photo. The more famous one is more dramatic, but, historically, less significant. I’ll merely mention that Charles Lindberg is not Charles Lindbergh, the noted aviator and Nazi sympathiser. This photo is more compelling than the famous one because of the soldier with a rifle keeping look-out. That is impressive. Is that Mr. Lindberg? Thanks for this story. I added it to my del.icio.us bookmarks so I can share it with other history lovers. Thank you for posting this. Thank you, Charles, for a life well lived.